Horseshow season might be starting to wind down; however, camping season can run all year long depending where you live. Those of us lucky enough to live in sunny California can camp almost any time of year. 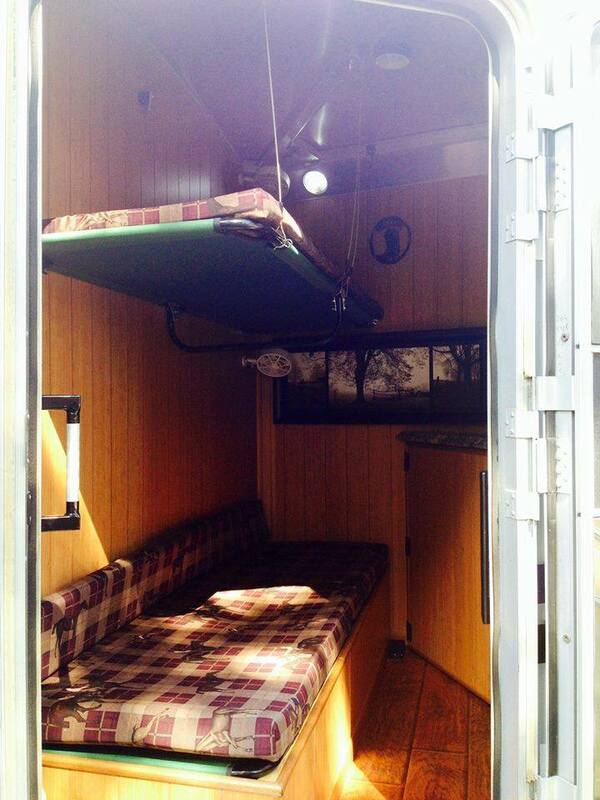 I was perusing the typical Pinterest boards, looking for some new ideas to use my horse trailer as a camping trailer. I have a very old, very out dated, two horse, straight-load bumper pull trailer. I call her “Betty”. Betty has seen over a decade of traveling with me, it’s not pretty, but she’s functional and has safely hauled my horses across state lines many a time. I saw some pretty nifty ideas of ways to use your trailer tack room or dressing room as sleeping quarters. With this bumper pull dressing room they put a single small sleeping space above all the storage. This would be great for quick trips or weekend horse shows where storage and organization becomes more necessity than sleeping! The owners of this trailer made a new meaning to bunk beds! In the right corner, they put an area in for storage. You can also put a refrigerator or shelving unit in this area to really maximize the space. This may be one of my favorite transformations of a tack room that the owners turned into a bed, dinette and storage! They even went the extra mile and added a microwave, mini fridge and television. The last conversion is not really a conversion but a quick fix. If you want to take your horses camping and don’t want to lug around a tent or convert your tack room into a sleeping area, hanging a hammock in the horse trailer can be the perfect bed for a weekend getaway! These are just a few of the seemingly endless ways to convert and alter a horse trailer to create a small living space for life on the road. Organization and storage can be two of the most important aspects of converting your trailer. If you have any trailer conversions you would like to share please feel free to leave them in the comments! RodeoChat Takes On Cheyenne Frontier Days!